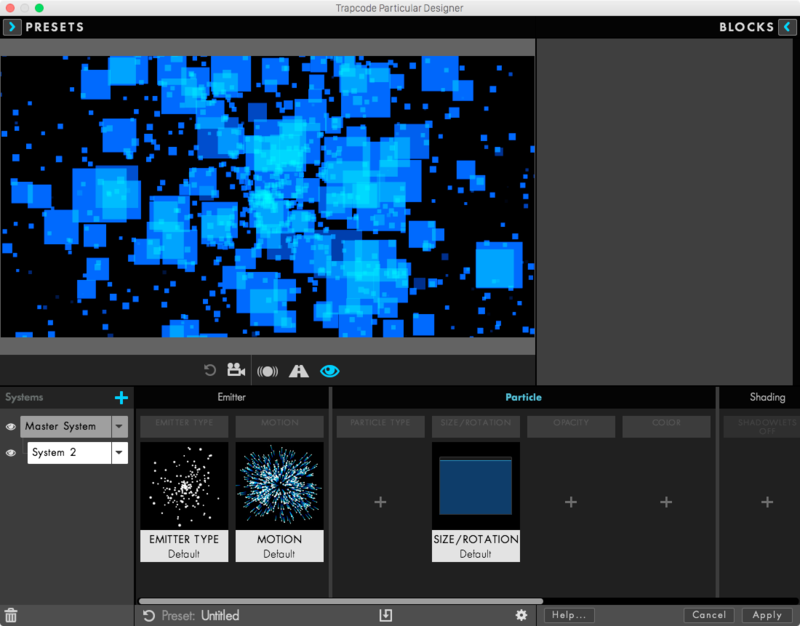 Multiple Systems take all of the power and complexities of Trapcode Particular and multiply and compound them. 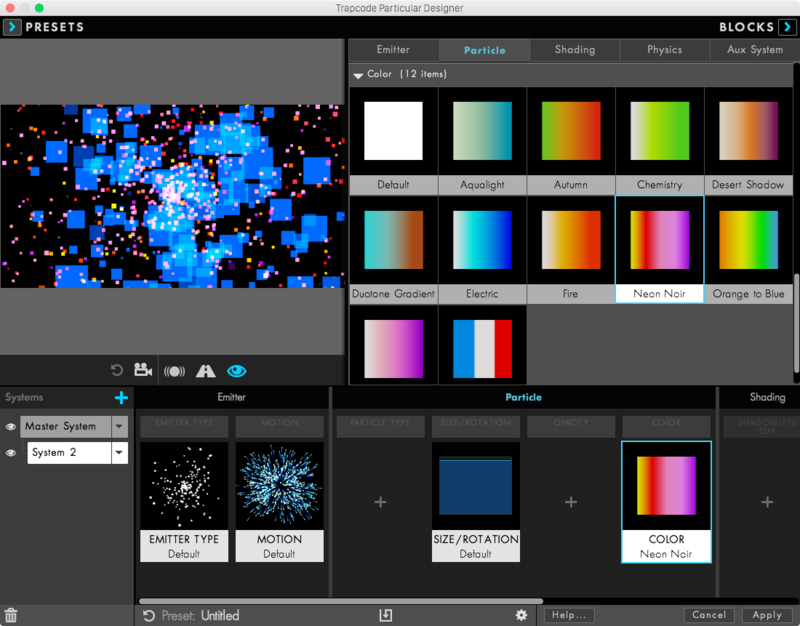 The Designer allows a much easier and visual way to work with Multiple Systems, and also contains a wealth of Multiple System presets to use. Individual Blocks for each component of each system can be quickly disabled or deleted. And, as creating a new system from the Particular UI in After Effects launches the Designer anyway, the Designer should be thought of as a hub for both creating and adjusting Multiple Systems. On the left side of the Effects Chain, there is a Systems area which displays all of the systems you are currently using. This area also gives you a great deal of power for creating and adjusting systems. 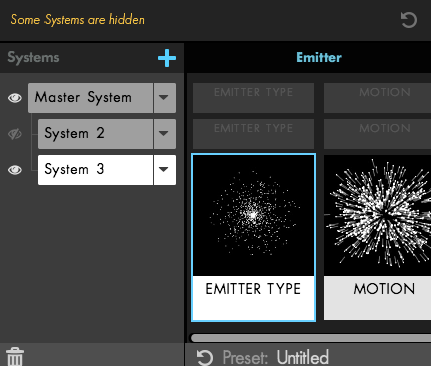 Perhaps the fastest way to create a Multiple System is to apply a Multiple System preset from the Multiple System Presets tab of the Presets pane (as covered in the Presets in the Designer page). However, it’s important to understand how to create and adjust systems on your own. The Designer gives you several ways to do this. You can quickly add a new system by clicking the blue plus sign icon in the Systems area (on the left side of the Effects Chain in the Designer). This creates a new system with the default Particular settings. Another quick way to add a system is to Option+Click any Single System preset, which will automatically populate a New System to the end of your current system chain with the Single System's settings. You can click on the right side of a system selector (or right click anywhere on the system selector) to get a helpful pop-up menu. From this menu, you can choose to create a duplicate system. This creates a new system with the same settings. To select the different systems in your project, click on the name of the system in the Systems area. Selected systems are white, while deselected systems are gray. When you select a system, its Blocks become brighter and full size, showing the thumbnail for the Block in the Effects Chain. Deselected systems have gray Blocks, and have their thumbnail temporarily hidden. Left to right, with the Master System selected, with System 2 selected. 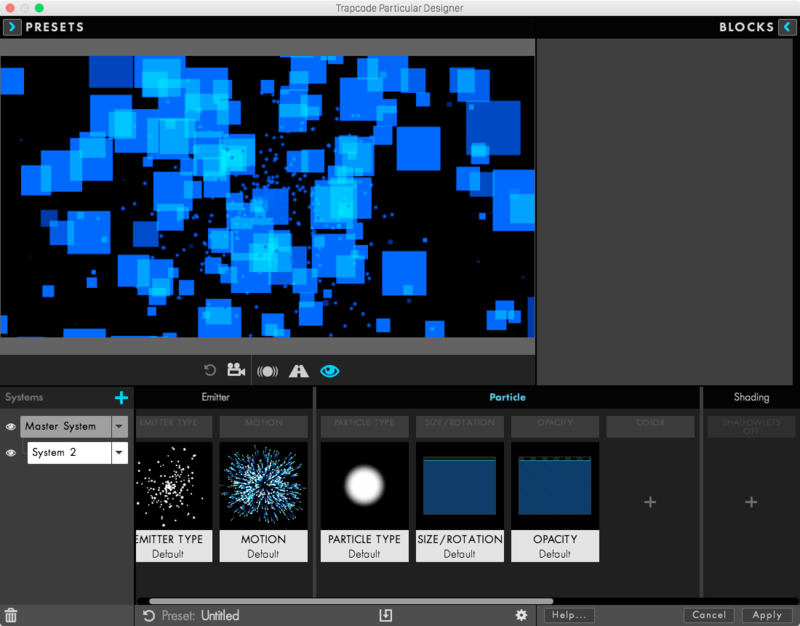 From the systems pop-up menu (discussed above), and in other parts of the Effects Chain, you have a great deal of control over Multiple Systems. 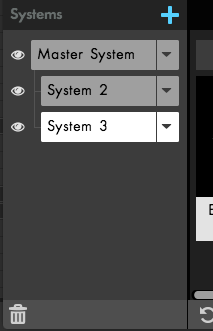 To change the visibility of a system, you can click the eye icon next to the system selector in the Systems area of the Designer. A white eye icon indicates that a system is visible, while a gray eye icon with a slash through it indicates that the system is currently hidden. The eye icons indicate that the Master System and System 3 are visible, while System 2 is hidden. When you have a system that is not visible, a message is displayed indicating that a system is hidden. To restore visibility to all systems, choose Unhide All Systems from the system selector pop-up menu. It’s frequently helpful to see just one system at a time, or in other words to solo it. There are several ways to solo a system. You can choose Solo System from the system selector pop-up menu. When you only have one system visible, a message is displayed indicating that you have a system that is soloed. Alternatively, you can also solo a system by holding the Alt/Opt key and clicking the eye icon to the left of the system selector. 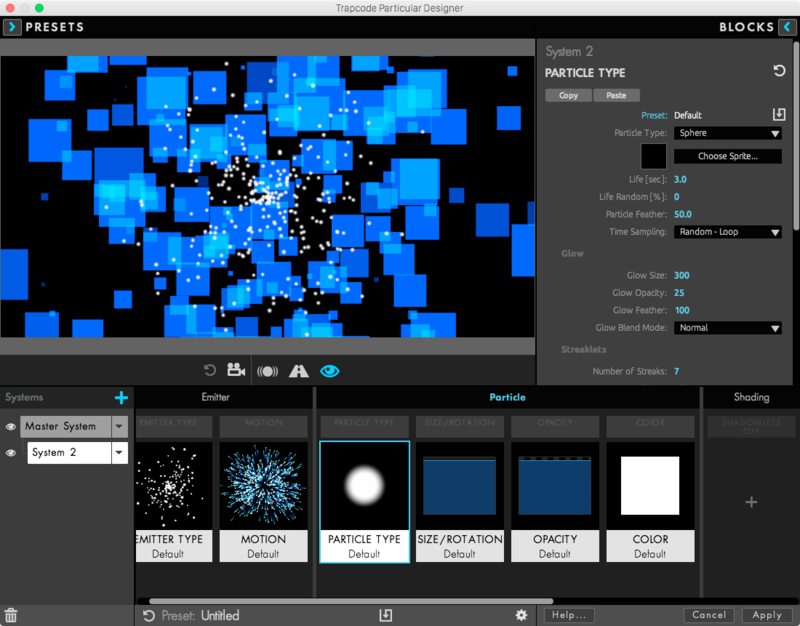 Occasionally you might want to reset just one system back to Particular’s default settings for a particle system. Simply choose Reset System from the system selector pop-up menu. Note that this will reset to the defaults of Particular, NOT of the Master System. This means that nothing will be inherited from the Master System in the newly reset system. 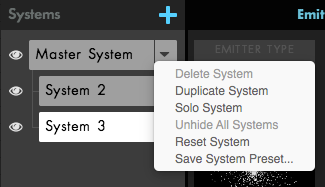 You can delete a system in the Designer in one of three ways. Select the system selector and press the delete key on your keyboard. Open the system selector pop-up menu and choose Delete System. Select the system and click the trash can icon at the bottom left corner of the Designer. 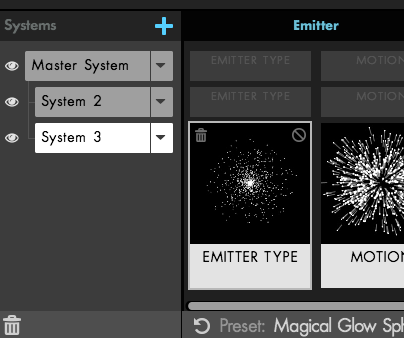 When you create an additional system, it creates a new system with the default settings in Particular (you know - white spheres, point emitter, etc.). But for secondary systems (i.e. non-Master Systems), you can cause attributes to be inherited from the Master System by deleting Blocks. We’ll look at exactly how to do this later on this page. But for now, let’s look at a very brief tutorial to understand how this works. I’ve created a new simple particle system. It’s just a bunch of blue squares. Now, I’m going to add another system. 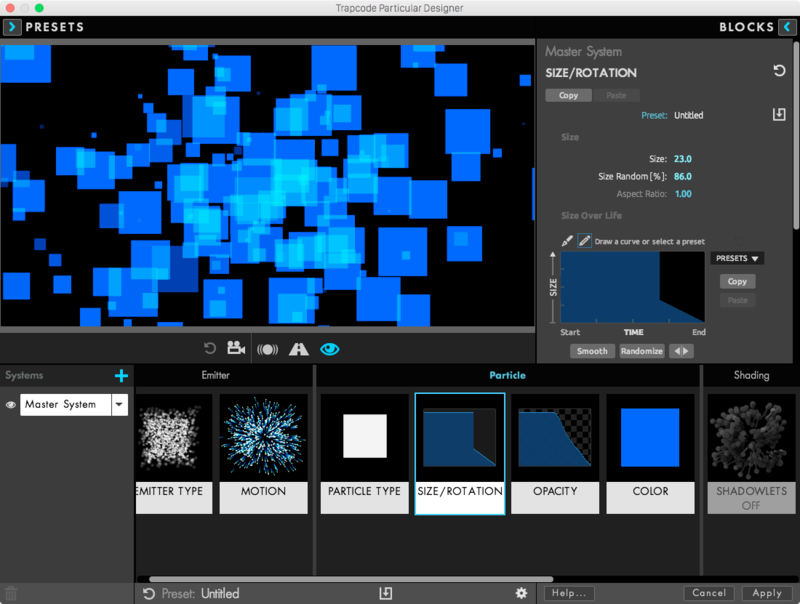 Notice the default white Particular particles over the top of my blue squares. Now I’m going to go to the Blocks in the Effect Chain for System 2, and I’m going to delete the Color Block (which we’ll look at how to do later). By deleting the Color Block on System 2, it tells Particular to “inherit” this particular attribute (i.e. color) from the Master System Block. Thus, it turns blue, using the Master System’s color instead of its own color. Understanding this idea of attribute inheritance is essential for getting the most out of using Multiple Systems and the following features on this page. For secondary systems (i.e. non-Master Systems), we can delete Blocks, or simply disable them. When we disable Blocks, Particular gives us a chance to see what that Particular Block would look like using inherited values instead of the values of that Block. To see this, let’s go back to our previous example of a Master System with big blue squares, and a newly created System 2 with the default settings. Now I’ll disable a Block. 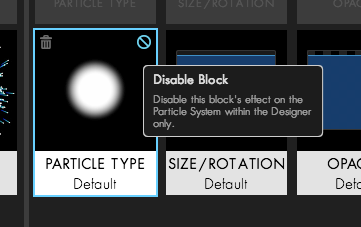 To disable a Block, click on the circle/slash icon in the upper right corner of a secondary system Block. 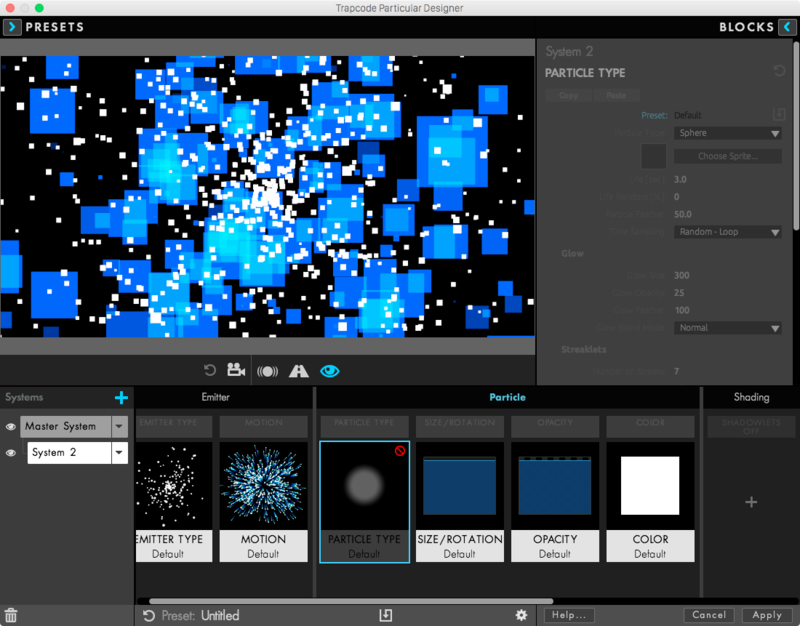 In this case, I’m going to disable the Particle Type Block on System 2 (the one with the default Particular settings). This will cause all other attributes to stay the same, except for Particle Type. By disabling this block, it will no longer use its own settings (that of sphere), and will use the Particle Type of the Master System (which is Square in this case). Remember that this is only temporary. To turn the Block back on, simply click the icon again. To permanently use the inherited values for a Block, delete it. Deleting a Block from the Effects Chain of a secondary system will cause the settings for that Block to be inherited from the Master System. You can delete a system Block in two ways. If you have deleted the Block accidentally, you can immediately press Ctrl+Z/Cmd+Z to undo that action. When a secondary system is inheriting attributes from the Master System, there will be a plus icon in lieu of a Block. 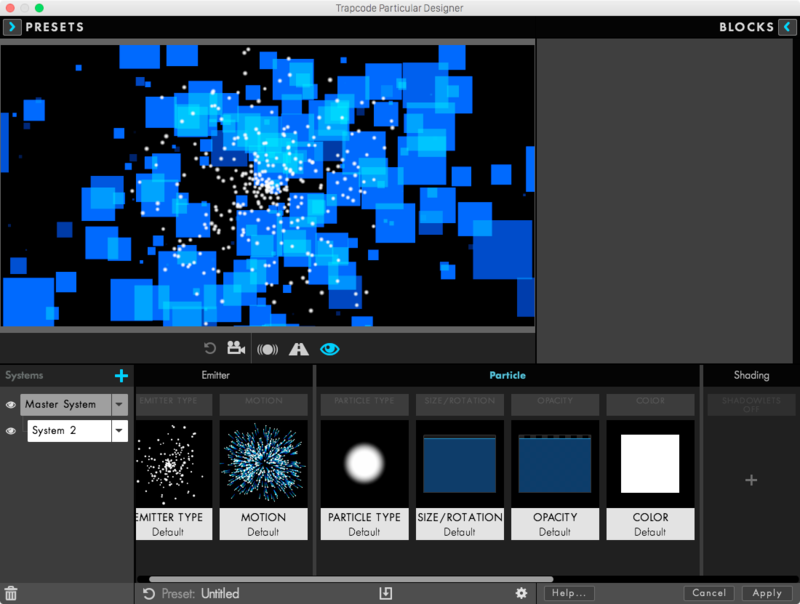 Here, the Particle Type, Opacity, and Color values are inherited from the Master System. 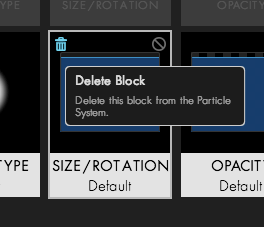 If you want a Block in a secondary system to become a proverbial “particle adult” and make its own choices and have its own set of values, you can click the plus icon and choose a Block preset setting. This will create a new Block for the secondary system, which will function independently from the corresponding Block on the Master System. In the following example, the smaller squares are being generated from System 2, a secondary system. As you can see here, Particle Type, Opacity, and Color are being inherited from the Master System. But if I click the plus icon in the Color Block area in the Effect Chain, the Blocks pane will open. When I select a new Block preset, it creates a new Color Block for System 2, giving it its own color, independent of the Master System settings. 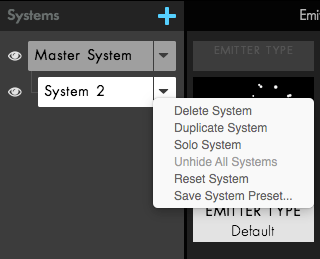 In the Presets in the Designer page, we looked at how to save your own presets by clicking the Save Multiple Systems preset button at the bottom of the Designer. This handy button saves all of your systems and settings for later use by going to the Custom folder in the Multiple System Presets tab of the Presets pane. But what if you don’t want to save all of your settings, just one system? To save just a single system, go to the system selector pop-up and choose Save System Preset. This will save a Single System Preset for that system only. 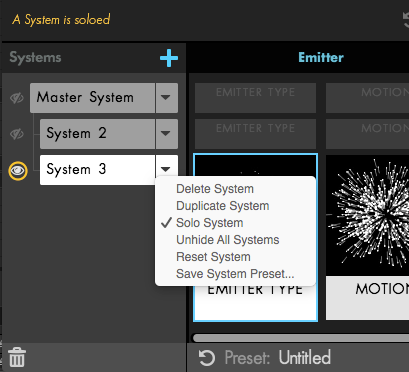 It will then be accessible for current and future projects in the Single System Presets tab of the Presets pane.